All things happening in our lives are right there in our phones - photos of our loved ones, events planned way ahead, important notes… Now if you misplace your mobile device it's all suddenly gone, so backing up your data is really important. SyncMate keeps it all in sync: contacts, calendars, bookmarks, reminders, etc. SyncMate allows syncing data on your Mac with Android devices and vice versa. With SyncMate Free edition you can sync contacts and calendars between your Mac and Android and view Android SMS messages directly on Mac. With SyncMate Expert edition you can sync images, videos, music, playlists, folders with files and more and manage text messages directly on Mac. These simple steps will explain how to back up your personal data from Android on Mac with SyncMate. 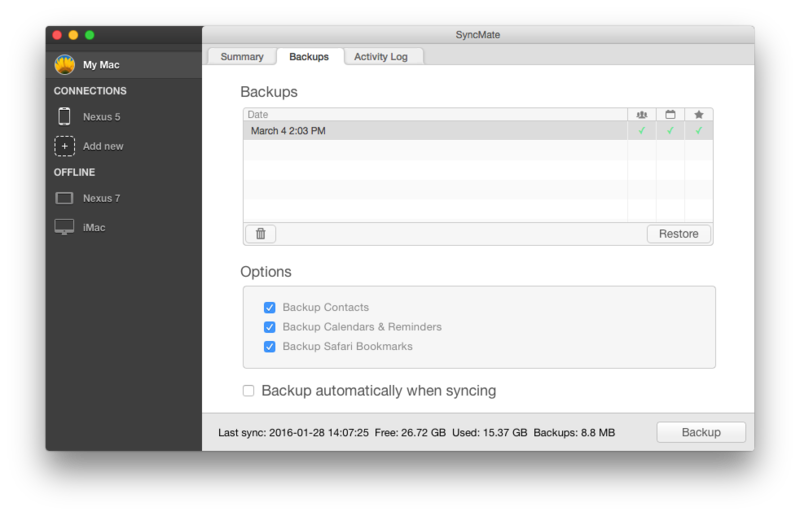 Note that SyncMate backs up data on your Mac (iCal, Contacts and Safari), so to back up data from your Android you will first need to sync it to your Mac and then create a backup. Download SyncMate Free edition, install it on your Mac and launch. "Backups" plugin is available in Expert edition only, so you will need to upgrade your Free version. You can upgrade here (we recommend you to test SyncMate Free Edition prior to upgrading to Expert). Click ‘Add New’ link in the left panel, choose Android device and connect your phone or tablet to your Mac. Choose what data you want to sync and back up. Press “+” button in the top panel and choose “Contacts”, “Calendars”, “Reminders” or “Safari bookmarks” plugin/s. Set sync options for each plugin. Press “Sync” button - your data will be synced. Go to “My Mac” section in the left panel and choose “Backups” tab. Choose data you want to back up - contacts, calendars, reminders or Safari bookmarks. Once you press Backup button, data on your Mac will be backed up. Once it is done, the file will appear in your Backups list. You can also enable automatic backup at the time of each sync session. If you want to restore any backup, just select it in the list and press Restore button - data will appear on your Mac exactly as it was at the moment of backup. After this you can sync data from Mac to Android. 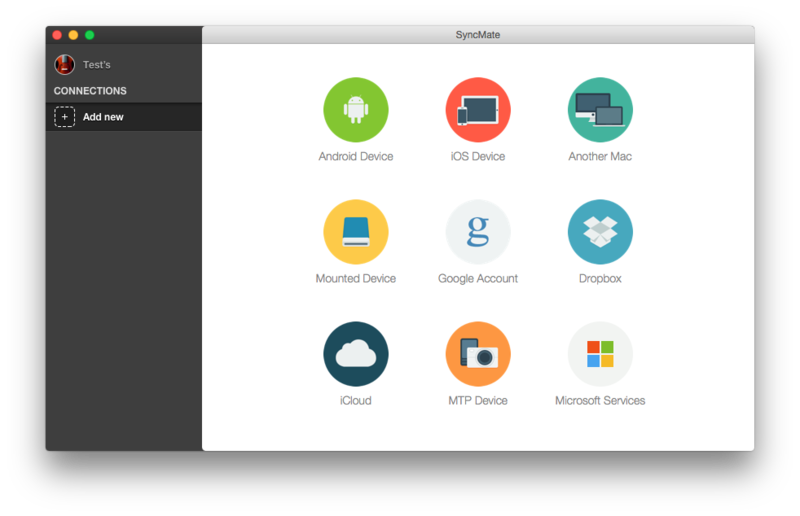 SyncMate can sync data on your Mac not only with Android devices, but with iOS devices, other Mac computers, online accounts and storages (iCloud, Google, Dropbox), Windows services (Outlook, Office 365 Home and Business editions). All these devices are synced with Mac within one app - SyncMate. Find more info about supported devices/accounts and sync options for them here.